In-Residence Magazine #02 is an artist publication by Vermeir & Heiremans, to be published on the occasion of the presentation of their new video Masquerade. Next to the artists' own research, the magazine offers articles by guest writers that give in-depth information on the issues that Vermeir & Heiremans' work touches upon. 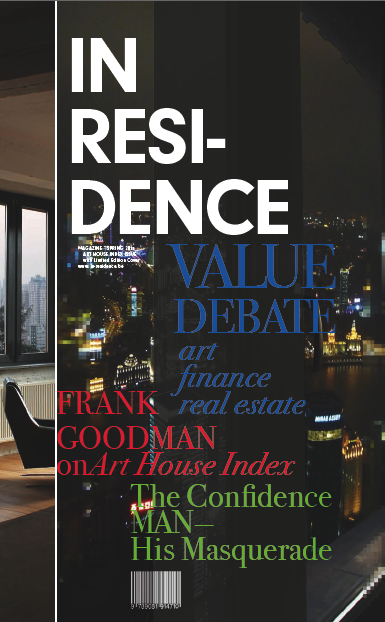 The artists chose a 'glossy' lifestyle magazine as the most appropriate presentation format for their work, which is linked directly to the content that is addressed in the video Masquerade, such as art & value, the construction of confidence in art and economy, financialisation in art and real estate and reproduction of capital. The artists apply a magazine's specific approach to form and content (editorial, interview, column, review, photo reportage...) to take on complex subjects in a playful, non-didactic way for a broad audience. Vermeir & Heiremans and Andrea Phillips are the editors of the magazine. Design of In-Residence Magazine #02 by Salome Schmuki. Andrea Phillips is Professor in Fine Art and Director of PhD programmes in the Art Department at Goldsmiths, London. She lectures and writes about the economic and social construction of publics within contemporary art. One of her recent projects is an investigation into the ways in which the art market shapes artists’ careers and public exhibition. She has also worked with Vermeir & Heiremans on the occasion of the Public Programme of the 13th Istanbul Biennial in 2013 and Masquerade, in which she plays one of the film's main characters. David Bassens, Fabian Bocart, Till-Holger Borchert, Florence Cheval, Eric Corijn, Michael De Lausnay, Benjamin Fallon, Michel Feher, Zachary Formwalt, Ciel Grommen, Nav Haq, Luc Hollevoet, Alexi Kukuljevic, Dieter Lesage, Anna Manubens, James M. Murray, Susanne Neubauer, Andrea Phillips, Jan Ritsema, Martha Rosler, Ulrike Schaede, Alain Servais, Gregory Sholette, Els Silvrants-Barclay, Kuba Szreder, Tom Trevor, Fatos Ustek, Akseli Virtanen, Mi You.